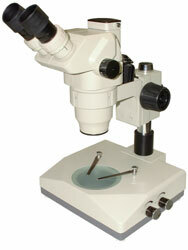 Optical system of HORUS series zoom stereo microscopes is newly, fully coated optical system sharp and clear images with extremely good flatness and contrast. The images are brighter and more distinct even as the periphery of the field of view. With their large zoom range and long-working distance, these are ideal for high-magnification, high-resolution observation in restoration and biological research, precision-oriented semi-conductor and other industries. 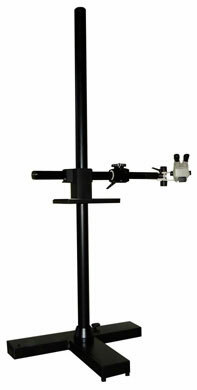 TViewing head: 45°or 60°inclined, 360°rotatable trinocular head, equip TV mount and Photo tube and Photo mount . 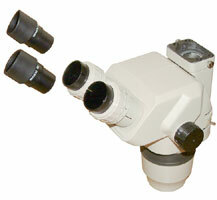 Eyepiece: Wide filed, high-eyepoint eyepiece-WF10X22mm. Plane focus arm, focused by rack and pinion w/ball bearing guide. 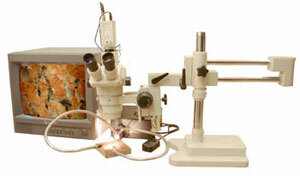 To observe specimen from different direction Provide more working area. It used with Focus Arm. To observe specimen from any direction or any angle. It used with HORUS trinocular head. If you equip photo tube and photo mount and photo eyepiece, then you can take pictures. If you Equip TV mount, then you can video output to TV, if you equip TV mount and Video catching card, then you can video output to computer. Magnification of CTV have two type as 0.5X and 0.35X.